Haq's Musings: Can Pakistan Economy Add 2 Million Jobs a Year? Pakistan's work force is about 68 million, according to the World Bank. 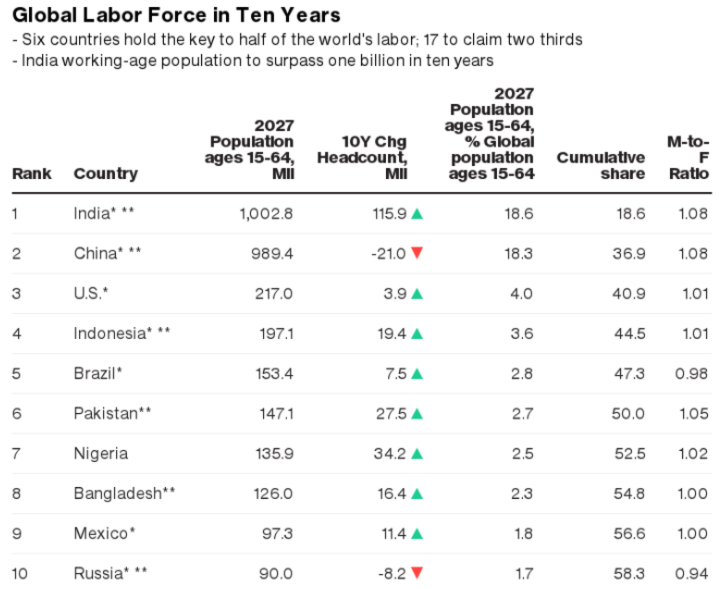 Its labor force expansion is the 3rd biggest in the world after India's and Nigeria's, according to UN World Population Prospects 2017. 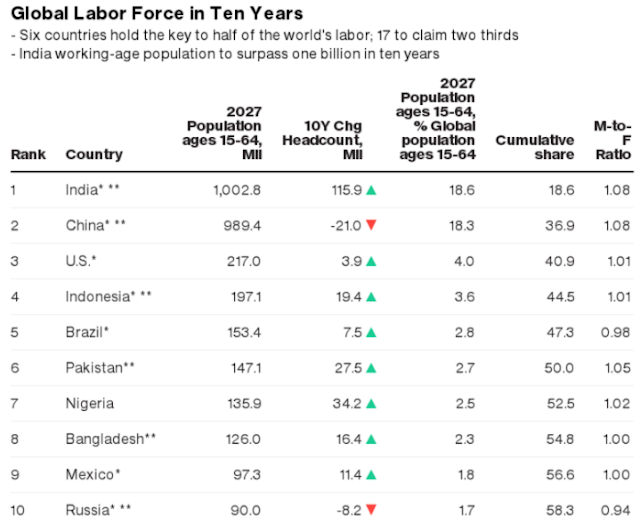 Pakistan's working age population in 15-64 years age bracket is expected to increase by 27.5 million people to 147.1 million in 10 years, according to Bloomberg News' analysis of data reported in UN World Population Prospects 2017. Pakistan's increase of 27.5 million is the third largest after India's 115.9 million and Nigeria's 34.2 million increase in working age population of 15-64 years old. China's working age population in 15-64 years age group will decline by 21 million in the next 10 years. Employment elasticity is a measure of the percentage of new jobs added in the economy for each percentage point increase in GDP. Employment elasticity of 0.5 means that there is 0.5% growth in jobs for each 1% growth in GDP. Analysis of the World Bank jobs data shows Pakistan's employment elasticity was about 0.70 in the period from 2000-2010. A little over 5% annual GDP growth enabled the economy to add jobs at a rate of 3.6% a year for the new entrants in the labor market. Since then, Pakistan's GDP growth rate has declined along with a decrease in employment elasticity to about 0.50, according to Asian Development Bank. The ADB reports says: "With an employment elasticity of GDP growth estimated to be around 0.5, economic growth of at least 7% is required to provide sufficient jobs". Rising working age population and growing workforce participation of both men and women in developing nations like Pakistan will boost domestic savings and investments, according to Global Development Horizons (GDH) report. Escaping the low savings low investment trap will help accelerate the lagging GDP growth rate in Pakistan, as will increased foreign investment such as the Chinese investment in China-Pakistan Economic Corridor. Increased savings and investments will not only enlarge the nation's tax base but also help create more jobs for the expected new entrants into the work force as it did in 2000-2010, according to a World Report titled "More and Better Jobs in South Asia". Historic data suggests that it takes investment of 4% of GDP to achieve 1% GDP growth, a capital to output ratio (COR) of 4, according to Pakistani economist Mohsin Chandna. This COR ratio will require an investment of 28% of GDP to reach 7% economic growth necessary to create over 2 million jobs a year over the next decade. Pakistan's current savings rate of around 13% will clearly not be sufficient to get to the goals of 28%. This gap will need to be filled by a combination of increased savings rate and substantial increase in foreign direct investment (FDI). Rising working age population and growing workforce participation of both men and women in developing nations like Pakistan will significantly boost domestic savings and investment. Increased foreign direct investment such as Chinese investment in China-Pakistan Economic Corridor over the next several decades will help fill the gap between the national savings rate and investments required to reach 7% annual GDP growth to create over 2 million jobs a year. Pakistan needs to create over 2 million jobs over the next decade to absorb new workers entering the labor market. With an employment elasticity of 0.5, it will require 7% annual GDP growth. A combination of increased domestic savings and higher foreign investment flows will be needed for investment of 28% of GDP to achieve the required economic growth for sufficient job creation in the country over the next 10 years. Index of human development devised by the Dr Mahbubul Haq reflects national well-being: life expectancy, education and welfare, as well as wealth of the general population. . Dr Mahbubul Haq preached that nations should spend less on Defence and instead investment in the development and education of their population. This will unlock the potential of the youth and this will create job /work opportunities. However he was not sure whether the countries of South Asia had the political will to cut their arms bills and finance their “essential human goals”. One can disagree with his recommendation of slashing defence spending and using the funds on human development; nevertheless it is hard to argue that most important objective of any gov’t should the human development. Most industries these days are capital intensive and in order to compete at the international level, automation (a more politically acceptable name for the work done by the robots) is a must. Coming from a rural area, I can say with certainty that agricultural sector does not have the potential to create even fraction of the required number of jobs. Thus Pakistan gov’t does not have the capacity to create 2-million jobs per year? Alternately, do we have the political will to spend 30% of our nation budget on Health, Education & Training and on providing safe drinking water to the Joe public instead of the grandiose projects like Metro buses? Or should we sit back and accept that Pakistan’s destiny is to remain a low to middle income country till the kingdom come. Niaz: "Or should we sit back and accept that Pakistan’s destiny is to remain a low to middle income country till the kingdom come." Pakistan needs to invest a lot more more in both human and economic development. A lot of savings and tax revenue are required for this purpose. Can Pakistan do it? Yes, absolutely. It happened in 2000-2008 on Musharraf's watch. Domestic savings rate reached 18% of the GDP and foreign direct investment (FDI) hit a record level of $5.4 billion in 2007-8. This combination of domestic and foreign investments nearly tripled the size of the economy from $60 billion in 1999 to $170 billion in 2007, according to IMF. Exports nearly tripled from about $7 billion in 1999-2000 to $22 billion in 2007-2008, adding millions of more jobs. Pakistan was lifted from a poor, low-income country with per capita income of just $500 in 1999 to a middle-income country with per capita income exceeding $1000 in 2007. Moh: " what we are doing to channel this 2 Mil to work globally"
Most of the developed world is experiencing a population bust with rapidly aging societies and plummeting birth rates. They'll need young workers to survive. 115 countries, mainly in Europe and America but also China (1.55), Hong Kong (1.17), Taiwan (1.11) and Singapore (0.8) are well below the replacement level of 2.1 TFR. Their populations will sharply decline in later part of the 21st century. I do see Pakistan growing quite a lot once CPEC is in place. But jobs, unlikely. Whatever manufacturing jobs are there in Pak will vanish once Chinese are here in bigger numbers. You cud end up like India post 2004, high single digit GDP growth but no jobs at all. Majumdar: " You cud end up like India post 2004, high single digit GDP growth but no jobs at all." There are some differences between growth in India and Pakistan. Big chunk of India's GDP growth has come from high-end service sectors like IT (information technology) which create few jobs. 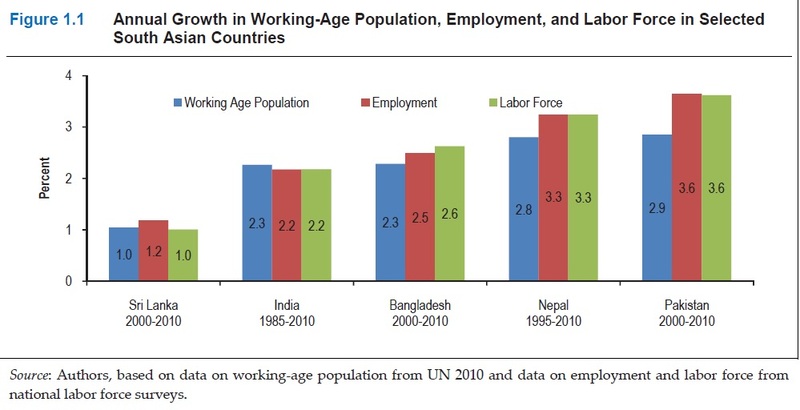 As a result, India's employment elasticity is less than 0.1, meaning jobs grow only 0.1% for each 1% growth in GDP. The idea of "service escalator" that some Indian economists promoted has failed to create the expected job growth.
" During its boom years, before the global financial crisis, India was growing in large part on the strength of investment in technology service industries, not manufacturing. This gave birth to a cottage industry of Indian economists trying to prove, in optimistic hindsight, that this approach would work as a development strategy. In a globalising world, they argued, more and more services could be delivered over the Internet. One might still need a local beautician for a perm, or a landscaper to cut the lawn, but the Net would make it possible to replace any number of local service agents, from the lawyer to the insurance broker, from the radiologist to the techie to fix your internet connection...Instead of growing richer by exporting ever more advanced manufactured products, India could grow rich by exporting the services demanded in this new information age. These arguments began to gain traction early in the 2010s in new research on the "service escalator". A World Bank 2014 working paper made the case that the old growth escalator in manufacturing was already giving way to a new one in service industries, which can range from taxi rides, haircuts and restaurant meals to medical care........ One basic problem with the idea of the service escalator is that in the emerging world most of the new service jobs are still in very traditional ventures, not in creating virtual realities or high-end travel experiences. Consider the ubiquitous kerbside tire repair stalls from Lagos to Delhi, or what might be called the barbershop in a box. In small Indian villages, many entrepreneurs will cut your hair for a pittance in what looks like a large plywood coffin, tipped up on one end. It would take a bold tourist to venture inside..."
In Pakistan, a lot of jobs are being created in labor intensive sectors like construction of housing, commercial real estate and infrastructure projects like CPEC. That's why Pakistan's employment elasticity is 0.5, meaning jobs grow 0.5% for each 1% growth in GDP. Beyond, China and Pakistan are working on many special economic zones where Chinese and Pakistanis and others will set up factories for exports as well as local consumption. These SEZs along CPEC route will add jobs in manufacturing, transportation and service sectors. An existing example of SEZ is Haier-Ruba special economic zone in Lahore. I'm not sure about counting chickens before they are hatched. Okay you say more chickens will hatch in Pakistan than India in the future and so on based on a simple economics formula - hypothetical isn't it? Rely on economists and weather people at your own peril. Any idea about 2010 to 2015? Ali: "Any idea about 2010 to 2015"
Effects of demonetisation and rollout of the Goods & Services Tax regime on the informal sector and reduction in pace of credit creation may affect India’s growth prospects and the country unlikely to serve as the “growth pole’’ for the global economy in the near future, a United Nations report has said. “Growth in the world’s two most populous economies − China and India − remains relatively buoyant, but the pace is slower than before the crisis and face some serious downside risks,” according to the UNCTAD’s Trade & Development report 2017 released on Thursday. The report titled ‘Beyond austerity — towards a global new deal’, further pointed out that it was absence of a robust recovery in developed countries and renewed volatility of global capital flows that have constrained economic growth in developing countries. It noted that the world economy in 2017 was picking up but not lifting off. “Growth is expected to reach 2.6 per cent, slightly higher than in 2016 but well below the pre-financial crisis average of 3.2 per cent,” it said. A combination of too much debt and too little demand at the global level has hampered sustained expansion of the world economy, the reported stated. Giving a prescription for makeover of the world economy, the report made a case for ending austerity, clamping down on corporate rent seeking and harnessing finance to support job creation and infrastructure investment. India’s growth performance depends to a large extent on reforms to its banking sector, which is burdened with large volumes of stressed and non-performing assets, and there are already signs of a reduction in the pace of credit creation, the report said. “Since debt-financed private investment and consumption have been important drivers of growth in India, the easing of the credit boom is likely to slow GDP growth,” it said. In addition, the informal sector, which still accounts for at least one third of the country’s GDP and more than four fifths of employment, was badly affected by the government’s “demonetisation” move in November 2016, and it may be further affected by the rollout of the GST from July 2017, the report added. “Thus, even if the current levels of growth in both China and India are sustained, it is unlikely that these countries will serve as growth poles for the global economy in the near future,” it concluded. a global recovery is clearly unwarranted. Cement sales in Pakistan rose 10.9 per cent YoY in August 2017 to 3.766Mt from 3.585Mt in August 2016. In the northern region, dispatches reached 2.731Mt, up from 2.495Mt in August 2016, while in the southern region dispatches rose from 0.532Mt to 0.625Mt during the same period. Some 307,000t of cement was exported from the north, significantly less than 355,000t reported in August 2016. Exports from the south slipped from 203,000t to 103,000t. Capacity utilisation in August surpassed the 96 per cent mark, according to the All Pakistan Cement Manufacturers’ Association. In the first two months of this financial year, Pakistani cement plants delivered 7.148Mt, up 21 per cent YoY. Domestic consumption improved 28 per cent YoY, exports declined 13 per cent YoY. Cement demand in the north increased by 28.5 per cent in the north and by 25.4 per cent in the south in July-August 2017. Exports in the north and south declined by 2.5 and 25.4 per cent, respectively during this period. According to latest PAMA data, Pakistan local car assemblers, including LCVs, Vans and Jeeps, have sold 22,000 units in August 2017, an increase of 25 percent annually. These numbers are above the estimates. Experts attribute this increase to string of new models and facelift introduced recently propelling sales. Sales of Honda (HCAR) have outperformed peers, posting 47 percent YoY growth. These are the highest monthly sales in history of the company at 4,666 units due to successful introduction of new Civic model and new SUV variant BR-V. Sales of Pak Suzuki Motor Company have increased by 32 percent YoY in August 2017 due to strong sales of Wagon-R, +75 percent YoY and new model of Cultus increased by 69 percent YoY. Mehran sales also rocketed +28 percent YoY supporting PSMC’s sales growth. Indus Motors sold 5,541 units an uptick of 2 percent YoY. The company’s focus remained on production of higher margin Fortune whose sales have shown stellar growth of 284 percent YoY. Also, buyers have resumed purchase of corollas which have shown YoY growth of 5 percent post the recent model facelift. Tractor sales continue to exhibit upward trajectory with sales growing by 115 percent YoY in August 2017. AL Ghazi tractor (AGTL) has been the top performer in this segment with robust monthly sales growth of 26 percent. Truck and bus sales of PAMA member companies in August 2017 remained strong, growing by 20 percent YoY. “We foresee this trend to continue, fuelled by CPEC led growth, higher road connectivity, lower financing rate and change & enforcement of axle load limit per truck on highways by National Highway Authority (NHA). The recent headlines on the Indian economy have been stark. Economic growth has declined for six quarters in a row. Inflation has more than doubled in the three months since June. The current account deficit in the first quarter of the current fiscal year was at its highest level in four years as a proportion of gross domestic product (GDP). Is it time to hit the panic button? Some of the worries are overdone. Inflation was expected to jump back from an absurdly low level in June. The current account deficit is still being comfortably financed by strong capital flows, though the dominance of debt investments as well as the spurt in electronics and gold imports deserve closer examination. And at least some of the sharp decline in economic growth in the three months to June can be explained by inventory destocking by companies ahead of the launch of the goods and services tax (GST), so a cyclical bounce back is quite likely over the next two quarters. Yet, there is no doubt that the Narendra Modi government faces its biggest economic challenge as it enters the final stretch of its tenure. It got an unexpected bonanza early on thanks to the collapse of global crude oil prices. It was a positive in terms of trade shock that acted as a growth driver. The sharp decline in the current account deficit added at least an extra percentage point to economic growth. The government prudently used the oil bonanza to strengthen its finances rather than immediately pass the benefits of lower global prices on to consumers. Monetary tightening by the Reserve Bank of India also helped secure macroeconomic stability after nearly five years. Prime Minister Narendra Modi has a jobs problem. He swept to power three years ago promising India’s poor and middle classes he’d restore their "dignity" after years of swelling inequality, with job creation central to his pitch. But now, the jobs market has been slugged by last November’s shock cash ban and July’s imposition of a goods and services tax. And things look like they’re about to get worse: India is set to see a further 30 percent-to-40 percent reduction of jobs in the manufacturing sector compared with last year, according to TeamLease Services Ltd., one of the country’s biggest recruitment firms. While other surveys aren’t quite so bleak, they also suggest Modi is a long way from creating the 10 million jobs a year needed to keep up with his young and rapidly expanding workforce. The opposition -- in disarray since losing to Modi -- is dialing up its criticism as it eyes elections due in 2019. "If India cannot give the millions of people entering the job market employment, anger will increase, and it has the potential to derail what has been built so far," Rahul Gandhi, heir-apparent to the main opposition Indian National Congress party, said in a speech at the University of California, Berkeley, on Sept. 11. "That will be catastrophic for India and the world beyond it." Gandhi is the son and grandson of previous prime ministers, and could well be Modi’s direct opponent at the next vote. Modi’s backers are alarmed too. A key ally and member of Modi’s party, Subramanian Swamy, told a TV channel over the weekend that he has conveyed concerns to Modi that the economy could be heading for a "major depression." The Rashtriya Swayamsevak Sangh -- the ideological parent of Modi’s ruling Bharatiya Janata Party that works like a volunteer wing to ensure voter turnout during elections -- has alerted the BJP of signs of a shift in the public mood over the government’s performance, though Modi still remains personally popular, according to a report in the Telegraph newspaper last week that cited unnamed RSS sources. Munira Loliwala, a general manager at TeamLease, said the slowdown accelerated sharply with demonetization. Indian manufacturers, who previously preferred to cut white-collar jobs rather than factory-floor workers, are now slashing all over, she said. "We see no option, things are not looking to improve much," Loliwala said. Loliwala was referring to Modi’s move in November to scrap 86 percent of currency in circulation, which contributed to growth in gross domestic product slumping to the lowest since 2014 last quarter. Modi then pushed through a nationwide goods and services tax on July 1, which is expected to benefit India in the long-run but for now is roiling supply chains. Manufacturing accounts for some 18 percent of GDP and directly employs 12 percent of the population, government data show. Loliwala said that many of those who lose their jobs stay unemployed because they lack the communication skills required for the services sector, which accounts for 62 percent of GDP. According to a recent report by the Pakistan Bureau of Statistics (PBS), Pakistan’s exports have shown a positive trend backed by rising exports via the value added sector. The growth pattern has been observed during the first two months of the current fiscal year 2017-18. The upward trend in the value added sector has given a significant boost to cummulative export numbers as the New Year kicked off. Total exports during the two month period, July-August, increased to $3.49 billion as compared to $3.12 billion showing a growth of 11.8%. While the increase in non-textile goods has been registered at 23.5% reaching $1.31 billion during July-August 2017-18 versus $1.06 billion during the same period last year. Readymade garments have given a major upward push to the overall exports pie increasing by 15.65% on a yearly basis reaching $418.63 million during July-August period. Garments in general have also surged by 16.4% showing volume based growth. Another integral value-added product, knitwear managed to go up by 7.53% to reach $439 million during July-August. The volume based increase of knitwear exports was 8.23%. Additionally, bed wear exports grew by 8% amounting to $384.32 million while its quantity wise growth stood at 8.79%. Furthermore, the value based growth of towel exports showed 0.67% rise while its volume based growth was registered at 0.03%. Conversely, the picture has not been equally nice for the intermediate goods like cotton yarn, as their exports slumped by 4% (value) and by 3.3% (volume). Deteriorating demand of cotton yarn and fabric from China is considered a crucial reason for their low sales. Another slump has been seen in the exports of cotton cloth, down by 7.8% in terms of value and quantity. Exports of raw cotton have also seen a downward trend with 14.7% in value and 14.15% in volume during July-August 2017-18. A major blow has emanated from exports of non-value added products such as cotton carded, which dropped by a whopping 100% in value and volume. In addition, exports of tents and canvas declined by 22% in terms of value. On the other hand, exports of yarn slumped by 0.2% in value but increased in terms of volume. Quick Read: When will Pakistani companies really value their human resource? From the non-textile related goods, rice exports grew by a significant 40% during the two months. Basmati and other types of rice exports took a major leap. From the food category, a major jump was seen in exports of wheat, sugar, fruits during the given period. Crude petroleum and petroleum naphtha registered a growth of 100% and 404% accordingly. Nonetheless, exports of sports goods and carpets saw a downward trend. Value added leather products increased by 5.8% which was witnessing continuous slump during the last two years. Footwear showed a feeble growth of 0.1% during July-August 2017-18. Furthermore, surgical and engineering goods managed to rise by 26% and 23% respectively. Karachi: Large scale manufacturing sector posted a four-year high growth of 12.98 percent year-on-year in the first month of the current fiscal year on infrastructure-driven boom and growing auto demand. Pakistan Bureau of Statistics (PBS) data on Thursday showed that iron and steel production climbed 46.36 percent in July over the same month a year ago, followed by automobiles (42.56pc) and non-metallic mineral products (37.95pc). LSM output increased 12.78 percent in September 2017 over the same month of 2016. PBS statistics revealed that production of billets soared more than 74 percent YoY to 476,000 tonnes in July. Production of tractors more than doubled to 5,087 units in July 2017 from 2,067 units in July 2016, while output of trucks, jeeps and cars, light commercial vehicles and motorcycles increased 24.4 percent, 55.75 percent, 16.03 percent and 26.46 percent, respectively. Other sectors that recorded growth in July included engineering products (21.95pc), food, beverages and tobacco (19.02pc), pharmaceuticals (11.14pc), paper and board (11.23pc), wood products (10.95pc), chemicals (5.13pc), coke and petroleum products (4.87pc), rubber products (4.51pc), leather products (2.52pc) and textile (0.43pc). Fertiliser and electronics sectors, however, recorded a flat production in July over the corresponding month a year ago. Large scale manufacturing grew 4.36 percent in July over June, according to PBS. Industrial production grew 5.02 percent in the last fiscal year of 2016/17. LSM, accounting for 80 percent of the industrial sector’s 10 percent share in GDP, posted a four-year high growth of 5.6 percent in the fiscal 2016/17. Government set LSM sector’s target at 5.7 percent for FY2018. Infrastructure development boosted demand of iron and steel products as well as cement, which are the key industries in the country. Auto sales have also been growing in the recent past as demand of heavy vehicles in China-funded development projects, uptake of passenger vehicles and rising sales of tractors for recovering agriculture sector speeded up production in the industry. The bureau logs trend of industrial sector on the basis of statistics from Oil Companies Advisory Committee (OCAC), ministry of industries and provincial bureaus of statistics. Ministry of industries track production trend of 36 products, Oil Companies Advisory Committee monitors 11 oil, lubricant and petroleum products and provincial authorities measure output of 65 items nationwide. OCAC registered a 4.87 percent YoY growth in July and edged up 2.51 percent month-on-month. Production of liquefied petroleum gas surged 75.5 percent YoY to 56.29 million litres. Kerosene oil output soared 66.5 percent to 14.78 million litres in July. Diesel production soared 41.33 percent to 2.15 million litres, while motor spirits output increased 14.6 percent to 237 million litres in July. Ministry of industries recorded a growth of 16.66 percent YoY and 8.09 percent month-on-month, said Pakistan Bureau of Statistics.